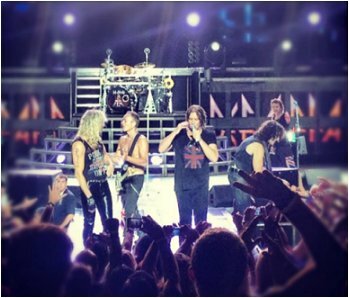 Def Leppard ended their Rock Of Ages Tour 2012 in Santa Barbara, CA on 15th September with Poison at the Santa Barbara Bowl. 43 shows were played on the main tour after the two promo shows in Hollywood for YouTube Presents and the premiere of the (not-so-successful-after-all) Rock Of Ages movie. Read the end comments made by Joe after 'Rock Of Ages' was played one last time in 2012. "Santa Barbara, California! Thanks for making our last night very special. It's been a real pleasure, until next time take care of yourselves. Goodnight!." "Really, can't thank you enough for a great end for a great tour. Good to be here. We gotta go." "So until next time, and there will be a next time!." "Do us a big favour yeah. Don't forget us and we won't forget you. Goodnight!."